Each edition is bottled at 57.8% ABV at 1000ml encased in a deluxe gift box set with two Glencairn glasses and limited to only 3,000 bottlings each. Celebrating its quest for excellence, Kavalan has placed First Growth Bordeaux wine casks from the Margaux and Pauillac regions at the heart of its 10th anniversary commemoration as it looks forward another decade. Kavalan CEO Mr YT Lee said the occasion was about looking back on the achievements of the past decade and striving harder for perfection in the next. “At Kavalan we have always sought excellence as a foundation for our whisky as we look into the future and work toward our goal of becoming, what in Taiwan we call a ‘century-old distillery,’ which is a brand capable of thriving even after hundreds of years,” he said. Master blender Mr Ian Chang said he and Mr Lee had traveled to the historic wine estates of France and handpicked the finest Bordeaux wine casks to age Kavalan’s young, award-winning whisky within the subtropical climate of Yilan, Taiwan. “We were intrigued by the distinctive flavours that might be possible from this unique marriage between Kavalan, where we pursue perfection daily, and these prestigious chateaux known for their centuries of excellence,” he said. Master blender Mr Ian Chang said the First Growth Bordeaux project had been an experiment in “how the spirit of these incredibly rare wines, through their splendid casks, could transform into a very special Kavalan whisky” and that innovation would continue to define Kavalan’s next decade. Kavalan’s inaugural whisky, Kavalan Classic Single Malt Whisky, was released a decade ago on Dec 4, 2008, and went on to become the whisky maker’s most popular expression. Each 1000ml Limited Edition gift box set is priced at a RRP of NT$8,800 (US$285). Global releases are in the planning for next year. 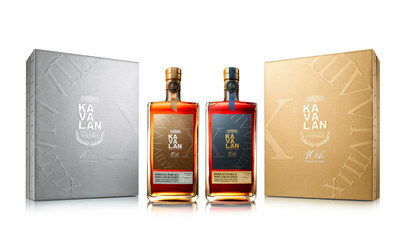 In Kavalan’s past decade it has achieved entry into the World Whiskies Awards’ (WWA) Whisky Magazine “Hall of Fame” for Mr YT Lee and his father Mr TT Lee; the WWA’s 2015 “World’s Best Single Malt” and 2016 “World’s Best Single Cask Single Malt”; the 2017 “Distiller of the Year” and six “Producer of the Year” awards from the International Wine and Spirit Competition, as well as the 2018 “Distillery of the Year” from the San Francisco World Spirits Competition. Magnificent, characterful, and extraordinarily smooth, the Limited Edition Bordeaux Margaux achieves exquisitely luxurious notes of warm caramel and buttery fudge, thick dark molasses, and the soft sweetness of creamy vanilla. Nose: Beautiful aromatic caramel sauce infused with warming spices greets the nose. Thick, decadent dessert wine and simmering dark brown sugar emerge, followed by fresh fleshy fruit and gentle Cedarwood in the distance. Palate: A warming sweet arrival leads to a melting of rich, buttery toffee that’s studded with plump raisins. A beautifully light sour plum wine now appears with a faint, but assertive nuttiness. Finish: Long and incredibly rewarding. The sweetness mingles with the gentle tart notes to reward the drinker with a delightful dance of flavours on the tongue. Wonderfully opulent and subtly complex, the Limited Edition Bordeaux Pauillac bursts with sumptuous flavours of ripened fruits of the forest, delicious toffee apple, and gentle cumin, coriander and pepper spices. Nose: A beautiful nose of soft fruits, from ripe blackcurrants, to strawberries in syrup with a touch of apple. The wine influence is unmistakable. Smoked meat, cumin, ground coriander seeds, and finely grated pepper balance out the flavours. Palate: Soft fruits drizzled with toffee, before an explosion of fruity flavours and accompanying spices. It is highly enjoyable at cask strength and develops a delicious vanilla creaminess as it is held in the mouth. It handles dilution extremely well at a variety of strengths. Finish: Front of the mouth spiciness, cooked fruits, and throat-coating warmth.